In the strategic choice of a target market, the USB has changed course from an institution targeting the local market for business education, first to a national player and from there to a respected player in the international terrain, with a particular focus on Africa. To effect this transition, the USB had to broaden its language offer from Afrikaans only, to include a bilingual offer and a bouquet of programmes offered only in English. Change is also observable in the broadening and deepening of the School’s academic portfolio. Fifty years ago, the USB only offered the MBA degree. Today, the USB’s academic portfolio includes Master’s degrees in Development Finance, Futures Studies (with the IFR) and Management Coaching, Postgraduate Diplomas in Development Finance, Leadership, Project Management and Futures Studies, as well as PhD degrees in Business Management and Development Finance. Along with the growth in academic programmes, the number of research centres has multiplied, and so has the number of research publications, reflecting the continued emphasis placed on the development of a research culture and ability to support sustainable intellectual growth, both in the School and in our clients’ organisations. 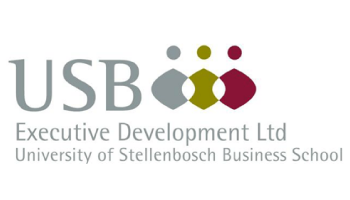 The business model for management education was radically changed at the end of the previous century, switching from an in-house model to a privately owned model with Stellenbosch University as principal shareholder (a world first), operating in tandem with the USB, with the objective to provide flexible solutions for the development of market opportunities for executive development around the world, while providing partial funding for the USB’s core academic activities. This solution has proven to be a resounding success, with USB Executive Development Ltd (USB-ED), which has proved to be much more than commercially viable, also reinforcing the USB brand globally. Growth in the number and diversity of faculty has been part of the change process. To an ever-increasing extent, faculty and staff resemble South African and African diversity, with a corresponding intellectual deepening. The growth path of the School is critically dependent on innovative solutions for the challenge to keep up the growth in intellectual capital with the market potential of the School’s academic offerings. All-round quality has always been part of the School’s vision and strategic intent. Over the years, the School has successfully managed to satisfy the international quality criteria of the industry, the educational sector and alumni, as certified by EQUIS, AACSB and AMBA accreditations. This so-called Triple Crown, held by only a few institutions in the world, provides the guarantees that the local player of fifty years ago has successfully transformed itself into a respected member of the international business school community. Visiting students from the class of ’64 will not recognise the modern physical facilities, nor will they recognise the faces of those welcoming them. But they may recognise the innovative spirit and the dedication to quality and, hopefully, they will feel familiar and at ease with the values they encounter. PROF EON SMIT was director of the USB from 1996 to 2010. USB acquired EQUIS and AMBA accreditation under his directorship.